I am just back from our wonderful tour to eastern Sicily staying in Taormina and Ortiga/Siracusa. 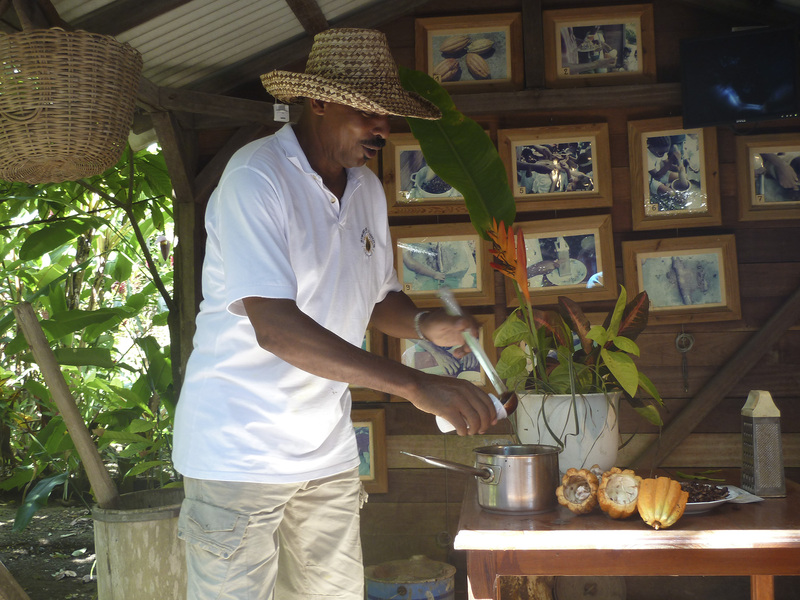 We discovered some beautiful gardens, met owners or head gardeners and tasted delicious food in their homes. In all it gave everyone a chance to experience Sicilian life at many levels. 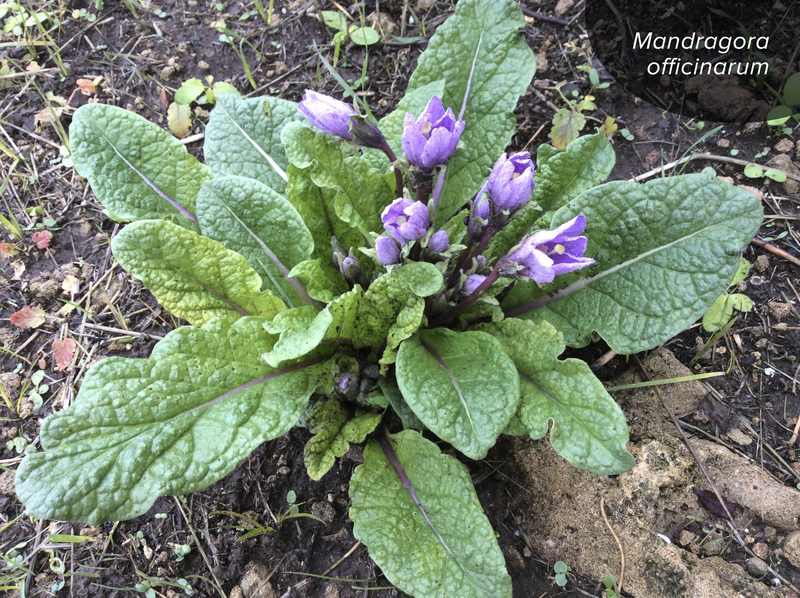 Though the countryside had suffered from the extreme heat in summer, we did spot growing in scrubland both Sea squills (Urginia maritima) and the mysterious Mandrake (Mandragora officinarum) which were both in flower. In September I took a private tour to the superb gardens of Upper Normandy. 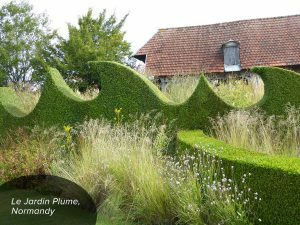 One of my very favourite gardens features on this tour: Le Jardin Plume with its exceptional design of structure with effervescent plantings. Terrific team work by Sylvie and Patrick with their head gardener, Gilles. At our base in a magical guesthouse, a typical Norman ‘Clos Masure’, Jean-François and Patrick, our hosts gave us culinary delights in delightful surroundings. This is one of our bespoke private tours which are available for friends travelling together or for small horticultural groups. 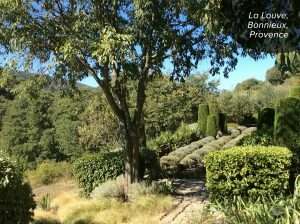 The warmth and colours of Provence in September with the backdrop of the Luberon and Les Alpilles gave us all a perfect setting to visit some excellent private gardens influenced by leading local designers. Each garden was different but with a similar palate of plants with cloud clipped hedges and rows of lavender. Staying in La Mirande behind the Popes’ Palace in Avignon is just a delight, from its beautifully restored interiors to the attractive little garden. A highlight was an evening with Jean-Claude Aubertin, chef de cuisine, enjoying dinner at the table d’hôte in the old kitchens. Why not join us next year in Provence (19-24 September 2018). My travels continue shortly to South Africa and Namibia. Gardens of the Cape are fascinating and beautifully planted. A Mediterranean climate, acid soil, humidity from the sea encourages a wide range of garden plants and the indigenous wild flowers ‘fynbos’ are amazing. In 2018 our tour to the Cape has been booked by a private horticultural group but we will feature it again in 2019. Our 2018 tours have had much interest and some are nearly fully booked. The new tour to Iran has proved very popular and is full. I am so pleased that Robin Lane Fox is joining us with his speciality being Alexander,The Great as well his weekly garden column in the FT. Harriet Rix is also with us as an experienced botanist especially in the Zagros mountains. The tour will be repeated in 2019 with similar dates at the end of April. The Caribbean has been badly affected by recent horrendous hurricanes but fortunately Guadeloupe has little damage – mostly foliage but in a tropical climate the regrowth is rapid. Beat Fischer, our Swiss botanist will lead us through gardens and wild flowers of this fascinating island. A good time to escape the winter season in Europe and we still have a few places available. In March I head south to Northern Namibia and the Okavango Delta in Botswana. A popular tour to see these countries in the green season with trees in blossom and swathes of grasses. An exciting number of birds are spotted and a wide range of wild life. A day to visit the Victoria Falls in Zimbabwe has been added. We have just a small group of maximum ten participants, Special remote lodges have been chosen and the days in the Delta are an unforgettable experience. Dumfries and Galloway has splendid gardens especially in May and staying at Knockinaam Lodge on the coast is memorable. An exceptional small hotel (just for us) lies in a remote bay. The excellent chefs were applauded last year by our French group – praise indeed. The effect of the Gulf Stream on the local gardens offers a rich range of plants and trees. Gardens of the North in early September is perfect timing for the gardens most of which are private. Included are some superb gardens on the west coast in Wester Ross. Staying at a country house surrounded by a vast estate gives a real insight into life in the North! Please call our office +44 (0)1423 326 300 or send an email to info@susanwornertours.com should you wish to have more information, we have prepared individual detailed brochures for each tour and are happy to send you a copy by post. Looking forward to welcoming you on a tour in 2018.